Lush Fab Glam Inspired Lifestyle For The Modern Woman: Beauty Counter: Designer Thierry Mugler's 'Taste of Fragrance' Collection! 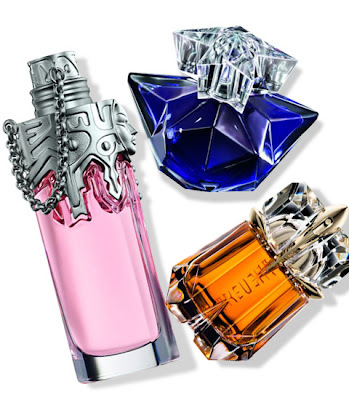 Beauty Counter: Designer Thierry Mugler's 'Taste of Fragrance' Collection! Ever had that moment when you spray on your favorite fragrance while speaking and get that bitter taste. Or even worst you're having the most romantic session but feel awkward knowing your partner just stopped kissing the nape of your neck because it tastes bitter from that perfume you spritzed on earlier? Angel is boosted by a cocoa powder-infused jam and caramelized almond accord. Alien, Mugler’s woody amber floral, has been embellished with a salted buttery caramel accord, and Womanity has received a boost via an essence of fig chutney that has been subtly spiced with sweet vinegar. Next time you go shopping stop by the beauty counter and test out Thierry Mugler's 'Taste of Fragrance' collection. What do you think of Thierry Mugler's 'Taste of Fragrance' collection? Leave a comment below. It's about time, I love Alien its one of all time favourites. Food tasting perfume so cool. I know whats on my Christmas wish list. lol @ bf stops kissing your neck because it taste like perfume had that happen too many times.